There is a place called the 'Valley of the Beavers' at the Chilean edge of Tierra del Fuego national park, where you can go to see miles of beaver dams in the otherwise dense coastal forest. A giant beaver (presumably with a person inside) roams the streets of Ushuaia with his companion, a giant penguin, waving at terrified children and trying to convince their parents to go on a guided "ecological tour" to see the beaver dams, which is a little bit like going kudzu-spotting in Georgia. The beaver is applying its legendary industriousness to destroying every part of Tierra del Fuego it can get to. I have never trusted the beaver. I find its obsessive work ethic disturbing and its Canadian origins suspicious. In its natural habitat, the main value of the beaver is as a conveniently packaged snack food for more relaxed animals like the wolf and bear, but neither of these predators has made it down to Tierra del Fuego, and the beaver continues to chew down the forests here unmolested. As the local park pamphlet will tell you, the beaver was introduced to Tierra del Fuego in the 1940's by "the man with economic purpose", on the assumption that the animals would thrive in the local forest and could be trapped for their fur. An equally indestructible rodent called the nutria had been introduced to Louisiana from Argentina shortly before, for the same reasons - why Argentina could not trap the nutria, while Americans focused on the beaver, is unanswered. In any event, both species have thrived wonderfully, while the market for natural fur has not. The beavers have now overrun the entire island of Tierra del Fuego, and to everyone's alarm some of the more athletic among them have managed to swim or float to some of the smaller surrounding islands. The beaver has no predators of any kind in the southern forest, which it finds tasty and commodious, and everyone is afraid of what will happen when a pair of the animals finally makes it to the South American mainland. There have been efforts on the Argentine side to eradicate the beaver by allowing unlimited hunting, but some evidence suggests that hunting pressure may actually cause beavers to increase their population as a defense. These guys are wily. The history of Tierra del Fuego is full of this kind of well-intentioned bumbling. In addition to the beaver, at various times the land has been beset by European rabbits, muskrats, foxes, Anglican missionaries, and the Argentine navy. The latest invader is the cruise ship tourist, rapidly turning the Fuegian city of Ushuaia into a boom town while making sure, along with the beaver, that you can spend long hours there without feeling like you have left North America. Tierra del Fuego proper is a large island, shared between Chile on the west and Argentina on the east, and separated from the South American mainland by the very narrow Straits of Magellan. The region is part of the Andes, which curl eastwards at the bottom of South America and gradually descend underwater, describing a slow U turn on the ocean floor before climbing out a thousand miles to the south as the Antarctic Penninsula. The mountains in Tierra del Fuego are heavily scarred by glaciers, which have carved them into an endless series of islands and narrow waterways. They have a rugged and intimidating look to them - treeline is only a couple of hundred feet above sea level, and the peaks all look like they've been freshly sharpened. The sawtooth mountains seem to be tearing the bottom out of clouds that run into them at high speed from the Pacific side. All of this is just for show. The island has a shockingly equable climate. It rarely gets hotter than sixty degrees in summer, or drops below twenty degrees in winter. The rain may be blowing horizontally, but you will never face a hard frost in Tierra del Fuego. The meteorological theatrics will make you forget it, but the island is at the same relative latitude as Denmark or northern England, temperate rather than subantarctic. While the winds ensure that nothing will grow too high, many species find the island a great place to live. Charles Darwin, of all people, writes a nice introduction to the flora and fauna (pre-beaver) of Tierra del Fuego, in his account of the voyage of the Beagle through these waters almost two hundred years ago. The only substantial city on Tierra del Fuego is Ushuaia, the southernmost city in the world. You will learn this interesting fact at the (southernmost!) airport and have it repeated it to you a dozen times before you can get to your southernmost hotel. Downtown, next to the Falklands Memorial, you will see an enormous sign reading "Welcome to the End of the World!" The End of the World is reachable on any of sixteen convenient weekly flights from Buenos Aires, which treat you to what has to be one of the most beautiful landings in all of commercial aviation - a descending 270 degree turn starting a thousand feet above the Beagle Channel. Remoteness takes on an interesting meaning in the age of international jet tourism, when being notoriously hard to reach can be an attraction in itself, giving a place like Ushuaia the top-notch infrastructure it is legendary for lacking. In terms of actual effort required to get there, the city is now about as remote as Topeka or Cleveland, although I won't discount the psychological impact of getting on a plane in Buenos Aires, itself one of the southernmost of large cities, and then flying due south for four more hours. In any case, for all its crowds and end-of-the-earth silliness, Ushuaia is as welcoming and pleasant as any Argentine city. World-weariness does not seem to be a part of the culture. Most of the visitors in Ushuaia don't fly in, but arrive on one of the giant cruise ships that dock here during the summer, on the South American circuit. As a result, the city is an empire of steakhouses and porphyry penguin gift shops designed for people with five hours of shore leave. You can pretty much buy the southernmost anything you want, if you can stand the markup. Last year over a hundred thousand people - twice the local population - floated in to Ushuaia, and more are expected in the year to come. 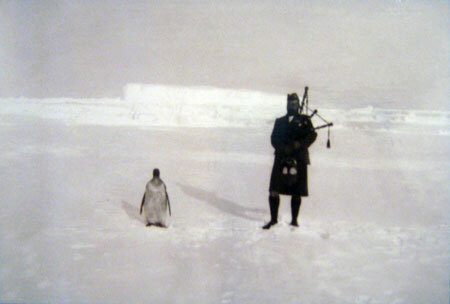 Not surprisingly, most were American, and a lucky twenty thousand or so were headed to Antarctica. Without the four thousand dollars, you can still have an excellent time on one of the small boats that tours the Beagle Channel from Ushuaia. The water in the southern oceans is some of the most productive in the world, so any exposed piece of rock will have a colony of some kind of well-fed aquatic animal. Seabirds predominate, but seals and sea lions are numerous, and there are occasional orca sightings. A Magellanic penguin colony hangs out further east along the coast. My own personal favorite is the steamer duck, a local orange-footed resident who swims in the Beagle Channel but cannot fly. When agitated, he spins his wings like paddle wheels and motors along the water at a surprising clip. 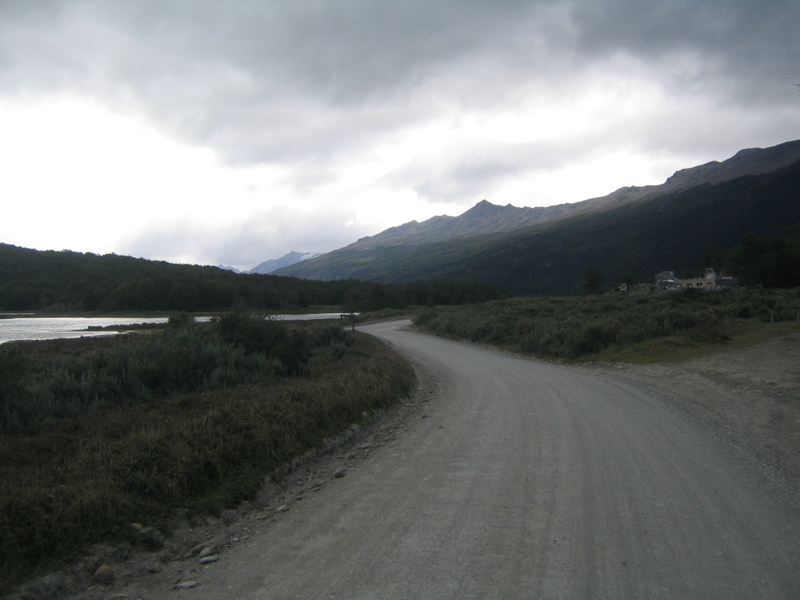 Outside of its congested center, Ushuaia rapidly transitions into a muddy warren of dirt roads, angry dogs, and new construction. Buildings are going up as fast as people can pour the concrete. The city is expanding quickly, with a Hobbesian approach to zoning, and given a choice between finishing one building and starting another the builders invariably choose the latter. This gives the outer town a rather stark, Romanian feel, with bare cinder block walls and little in the way of coherent urban planning. A series of identical multi-story apartment buildings stands in the background, up against the mountains, housing an earlier wave of new arrivals. The mountains prevent any of this from getting you down. Ushuaia sits in the middle of mind-numbing scenery, and fifty thousand people are not enough to even make a dent in the postcard beauty of it all. A walk through the outskirts of town soon takes you uphill, past the wonderfully named Buena Esperanza water treatment plant, and up a slalomy road that passes hotels of increasing swankness until reaching the world's southernmost ski resort and chair lift. This takes you up to the Glaciar Martial, a sad patch of snow with sensational views of Ushuaia and the Beagle Channel. The glacier is seriously ailing and predicted to disappear completely within about five years, part of a general retreat in the Patagonian glaciers, but you can still get a good steak along its southern edge. There is a frequent afternoon effect where the ground is sunlit but the sky behind it is heavily overcast, making it appear darker than the ground. This is a very cool thing to see, when you are staring at Chilean islands to the south and eating steak. The natural history of Tierra del Fuego is spectacular and grandiose. Its human history is pretty much one of unremitting misery. The earliest natives settled here while the glaciers were still covering a substantial part of inland Patagonia (not exactly a sylvan paradise even after the glaciers receded), and as near as anyone can tell, they spent their lives hunting seals and being very cold. Books and anthropologists will tell you that the tribes adapted to the weather, but if you are smearing yourself with seal fat and keeping an open fire in your canoe, you have not adapted. Tribes further to the west were able to hunt guanaco, and in the surviving photographs of them standing in a guanaco-hide poncho you can see a look of palpable relief. The first white people to visit - for example, Darwin's captain FitzRoy, - had an unfortunate habit of taking locals back with them for display and religious education in England. While these kidnapees were well-adapted for the damp cold and monotonous diet, they were not at all prepared for English diseases, and in the end it was deemed more practical to bring Jesus to the natives. Anglican missionaries duly arrived, learning the natives' fascinating language and mythology in order to provide them with a translation of the world's dullest religious text. After the missionaries came the Argentine navy, bringing measles and other diseases that suddenly rendered the missionaries' obsession with the afterlife extremely relevant. 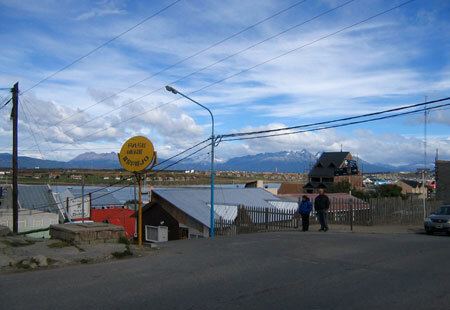 The Argentines built a provincial capital here (two buildings) and recognizing the potential of this remote, damp and miserably cold location, a prison. And then the beavers came. Other places with this kind of history might grapple with how to present it. But the Ushuaia prison, now a museum, neatly sidesteps the problem by treating the whole episode as a wacky historical adventure. The prison is built in the shape of a starfish, with each arm holding about sixty cells, and inside each one is a haphazard assortment of documents, a few photos, a mannequin, or the occasional model ship. One part of a wing is dedicated to prisons the world over, showing photographs of various penal facilities in India, Indiana, Britain and France. Another wing has been left completely untouched (and unheated), so you can vividly imagine the wacky, fun life of an Ushuaian prisoner for yourself. The cavernous central hall holds a bar and gift shop. The prison here closed down in 1947 and the town resumed its status as a backwater. In 1976, when a military coup deposed Isabela Peron and installed the vicious period of dictatorship, the province was considered so unimportant that the junta didn't even bother to secure it - the residents only heard about the coup by radio. It's only recently that tourism and natural gas have drawn people here in significant numbers. 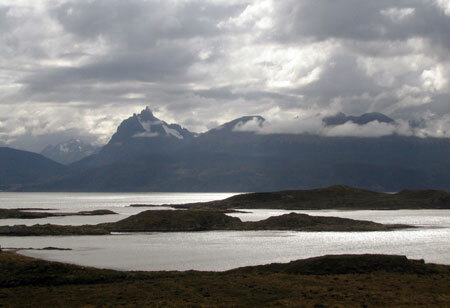 Outside Ushuaia, Tierra del Fuego remains remote and almost unvisited. Sandwiched between the western edge of the city and the Chilean border is the lovely Parque Nacional Tierra del Fuego, offering that rarest of Argentine park amenities, the comfortable day hike. The park has a variety of forest habitats along with a nice coastal trail; a fun exercise is to compare your own experience to Darwin's, who schlepped across the same piece of land without a trail, exhaustively cataloging plants and animals as he went. It gives you a newfound respect for the skills of a nineteenth century naturalist. Darwin aside, it's impossible to write anything about this part of the world without feeling the shadow of Bruce Chatwin's In Patagonia , an extraordinary travelogue from 1977, which devotes a long section to Tierra del Fuego. Chatwin has a spare writing style that seems exactly suited for a book about Patagonia, and he has a talent for finding improbable, strange stories. The Fuegian chapters of In Patagonia are a mixture of history and local character sketches, both of them extremely engaging. Rather than parrot them here I will just point to the book as an example for anyone who wants to write about travel, and especially to anyone intending to go to Patagonia. The beavers, incidentally, nearly broke Chatwin's leg.